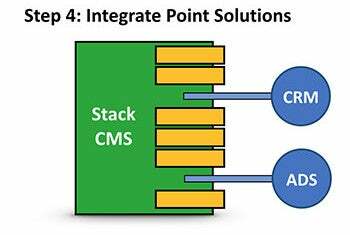 In my last post, I covered the pros and cons of Point Solutions and Stack Solutions to meet the marketing technology needs of your company. I concluded that there's really no one-size-fits-all solution, it's far more about knowing how to integrate different types of platforms as your business evolves. Today I'll be expanding more about how businesses might plan for their growth of their MarTech operations over time. Knowing how to plan for your company's needs as it grows can be a steep challenge, but it is definitely possible. This is where the value of a good marketing technology partner shines the brightest. Knowledge of the ecosystem and experience with growth mean that a partner worth their salt in this area can recommend a course of action that will be efficient, affordable, and follow a logical progression of growth and adoption to help ease transitions, reduce investment cost and painful upgrades. 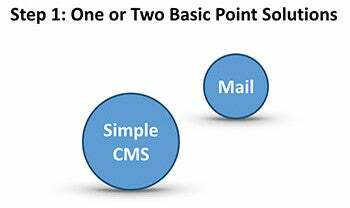 Start with 1 or 2 small-to-mid point solutions: You’ve got a website, and you want to make better use of it. Often you’ll start out with something small like email. It’s an “ecosystem” per se, but it may just amount to a Wordpress website and a MailChimp account. However, it’s a start, and that’s the important part: that it’s seen as a start. From this, you’ll begin getting some decent analytics and seeing some traction to grow your brand. Migrate to a Stack Solution: As your business grows, you may find you want to better leverage your users' behavior on the website, in order to personalize messaging and improve your marketing efforts. So you migrate into a stack solution, which allows you to start using your web analytics to directly influence your email marketing, personalize web content, and begin experimenting with some user segmentation. 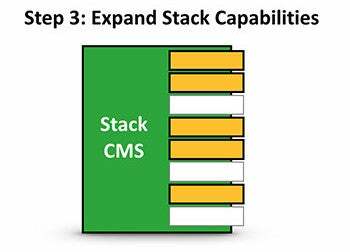 Grow within the Capabilities of the Stack Solution: Initial launches of a new site in a platform rarely come out of the gate using every feature available in the stack. Once the site is launched and stable in your stack solution, there will be a period of time where you want to get comfortable with the versatile pieces of your platform. Gradually, you'll make use of more and more of the features available to you. You start to add lead scoring, incorporate A/B testing on both site content and email messaging, and implement personas. Plan and Prioritize where New Point Solutions Integrations are Needed: As you make full use of the suite of features available within the stack solution, and the resources and sophistication of your marketing team grow, you’ll begin to understand where you would most benefit from more features, better data, or more robust platforms. Perhaps once your leads are scored, you want to move those segmented lists to a call center management software or a CRM. 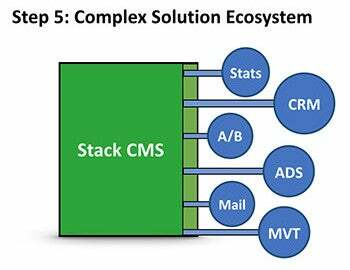 This is where the selection of your initial stack solution platform can really be crucial. 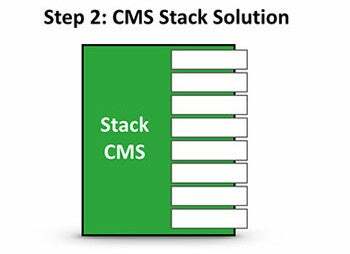 If you’ve chosen a system that integrates smoothly with other solutions, your original stack solution can remain as the hub of your site and content management, as you gradually integrate best-in-breed Point Solutions to replace the more basic features within the stack. Grow into a Well-Architected and Tightly-Integrated Ecosystem of Point Solutions: Over time, with wise selection of complimentary technology and best-in-breed players, you’ll end up effortlessly sliding into a large ecosystem of point solutions that meet the needs of your fully-realized marketing automation plan. If planned and executed correctly, your content and efforts from previous phases were able to migrate into newly-adopted systems, and you’ve limited waste (of both time and money) in the adoption process. Remember, even at this step, your use of technology will continue to grow, and you can always be looking for incremental improvement. You’ve achieved that well-architected and tightly integrated ecosystem, but that is not to say that your ecosystem and the parts within it won’t continue to evolve over time. Certainly, this is not a one-size-fits-all growth plan. However, it does provide a strong example of the kind of strategy that can help a company make the best use of the technology available to them at every phase of their growth. The important take-away is that in order to succeed, you'll need a solid long-term plan. Making key MarTech decisions on the fly will inevitably lead to all types of pitfalls, and waiting to consider each of these phases as an isolated point in time may mean scrapping all previous work and starting from scratch with each new set of technologies. To me, this just reiterates the importance of technical leadership in the area of marketing technology. These kinds of decisions can be daunting to a small business owner or marketing team that may not have much technology expertise in-house. The right partner can make all the difference in helping your company not just to grow, but to grow smartly.